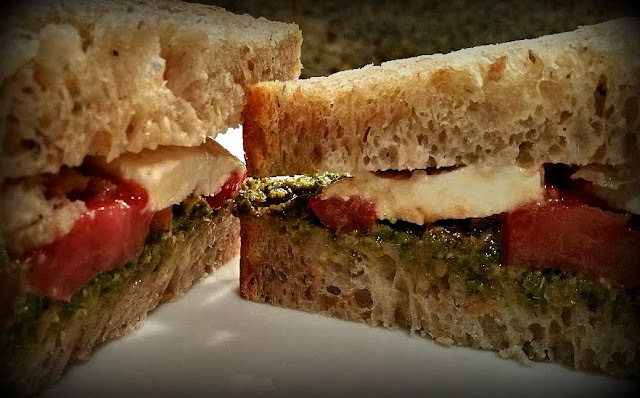 It is No-Cook Week at Food Network and my contribution pairs fresh-from-the-garden tomatoes with Buffalo mozzarella and spicy pesto made with basil and garlic scapes. 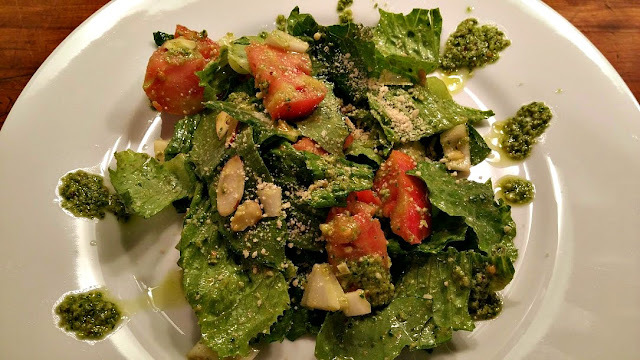 I know we just had Pesto Week a couple of weeks ago, but this version...classic pesto combined with garlic scapes...is so delicious I couldn't wait to share. Garlic scapes are a soon-to-flower stalk that grows at the top of the garlic plant from between the leaves. These "flowers" have to be cut off to ensure the bulb receives the necessary energy required to grow the garlic we know and love. This process is sort of like pinching the flowers off herb plants to aid in their growth. I love the clean, organic look of scapes. They curl into very interesting shapes and make lovely casual floral arrangements that I use for a day or two prior to turning into a delicious treat. Many people discard the garlic scapes when harvesting. If you grow garlic, do not let this happen. They are an amazingly tasty vegetable that can be used wherever you use garlic, green onions or chives. They taste like a milder version of fresh garlic with a bit less bite while still retaining tons of flavor. 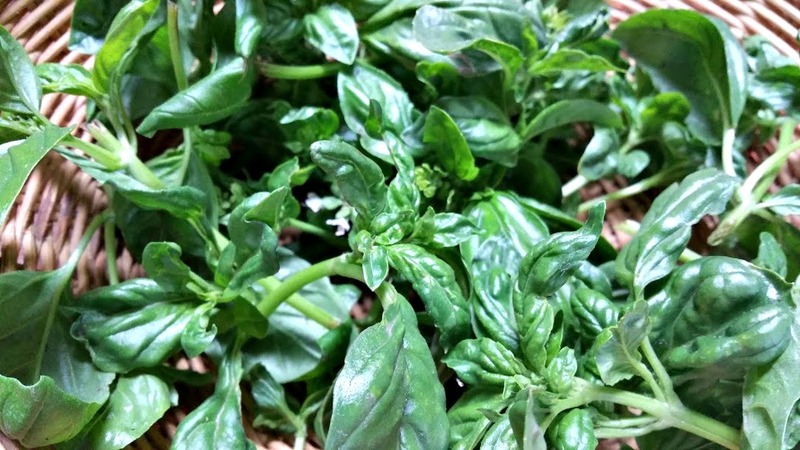 They can be chopped up and added to stir-fry, frittata, pasta or sautéed and added as a topping for pizza or bruschetta. 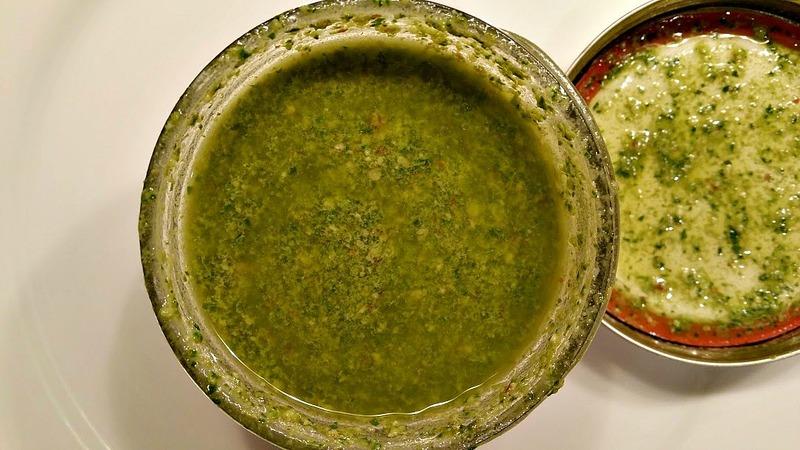 You will find many ways to use, but today they are being processed into pesto. 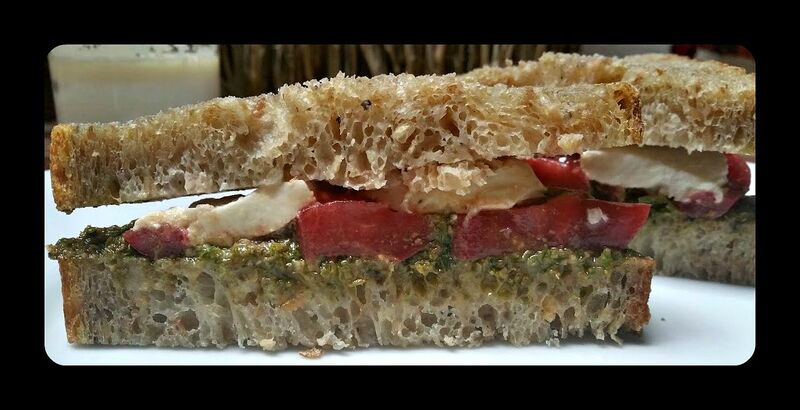 For the sandwiches, I spread a very thick layer of the pesto on a slice of really good, artisan bread. 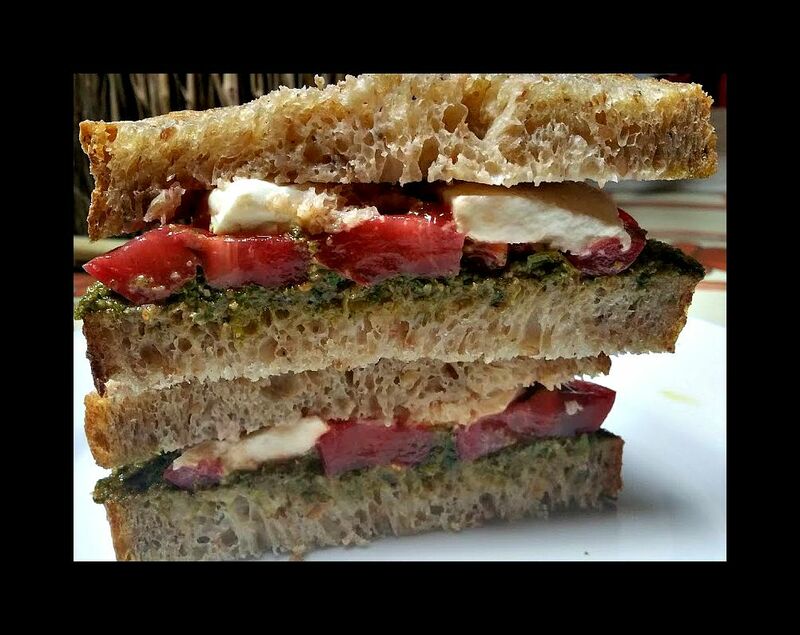 Then I pile ripe, garden grown heirloom tomatoes on top of the pesto, top with fresh buffalo mozzarella cheese and add the second piece of bread. When the temperature is soaring, I eat it just like that. When it is a bit cooler, I grill the sandwich or place in the panini press. Either way...delicious! For each sandwich, spread pesto on one slice of bread. Top with tomatoes, and cheese and second slice of bread. Cut in half and enjoy! 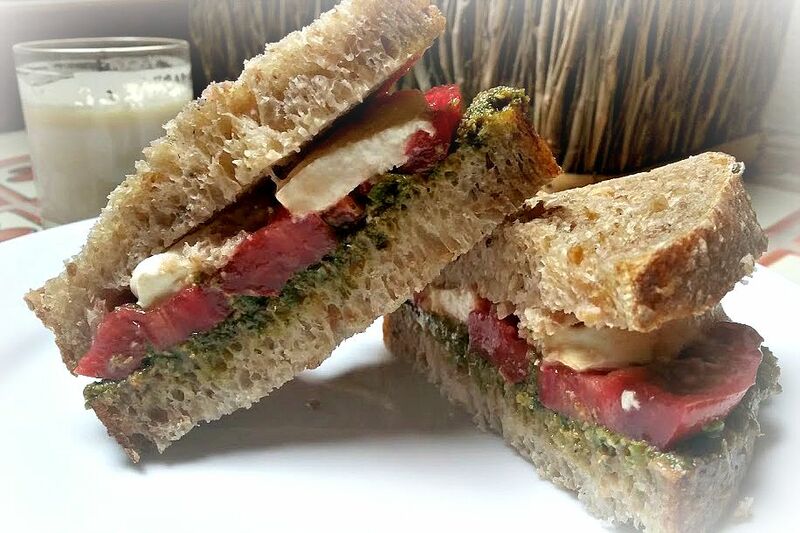 For non "no-cook" weeks, this sandwich is delicious grilled or placed in a panini press. Add cheese to a food processor fitted with the chopping/mixing blade. Process until the cheese is grated. Add cooled pine nuts, garlic scapes and red pepper flakes and process until all ingredients are finely grated. Add half of basil leaves, and 1/4 cup olive oil and process until smooth but with a bit of texture. Add remaining basil, remaining olive oil, 1/4 tsp salt and 1/4 tsp pepper. Process until well mixed. Taste and adjust seasonings if desired. Summer means easy, breezy dishes made from fresh, just-picked produce and this week at Food Network's Summer Soiree we are celebrating No Cook recipes. Do you have a favorite no-cook recipe? Share in the comments section and/or link to your blog if you have one. And be sure to check out the delicious sounding recipes from my blogger friends and Food Network. I admit it. I am a salsa addict. I can eat bowls of chips and salsa, and love to top chicken, fish, eggs, salad, you name it, with the classic tomato version. Or green tomatillo salsa for a change. But, guess what? 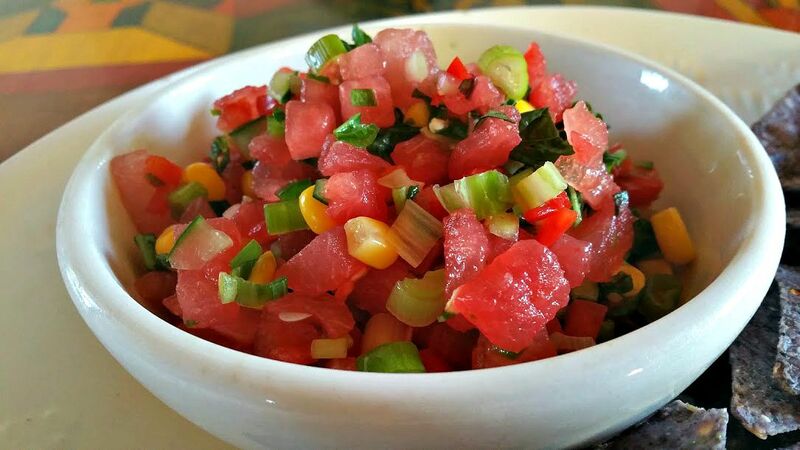 Fresh watermelon makes an equally delicious salsa. You have to give it a try. I add fresh corn to the salsa and there is something addicting (like how I am keeping the addict theme going?) about the sweet watermelon and corn combined with spicy chilies, green onion and a handful of herbs. 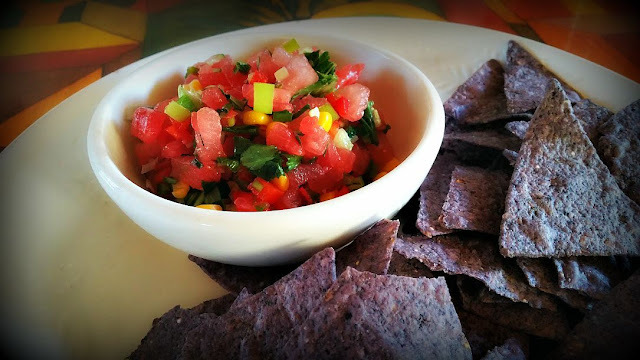 When the weather is really hot, this cooling and refreshing salsa is even better than the tomato version. Give it a try with tortilla chips, of course, but also as a topping for your favorite grilled protein. Combine all ingredients in a medium bowl. Taste and adjust seasonings if needed. Chill until ready to serve. 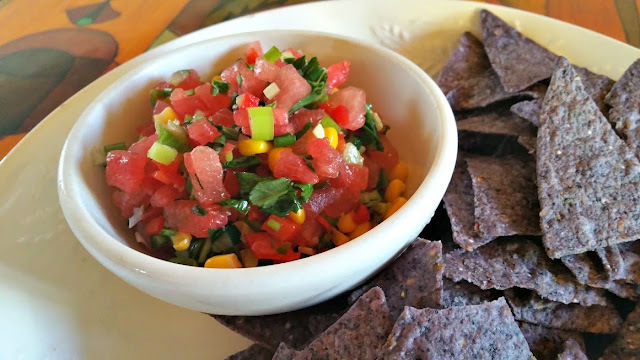 Delicious with tortilla chips or as a topping for chicken or fish. Note, this is best eaten the day you make it, but, in a pinch, I have made the night before. Just drain before serving as the watermelon will give off a lot of juice. And don't add the herbs until right before you serve. Summer means easy, breezy dishes made from fresh, just-picked produce and this week at Food Network's Summer Soiree we are celebrating Watermelon. 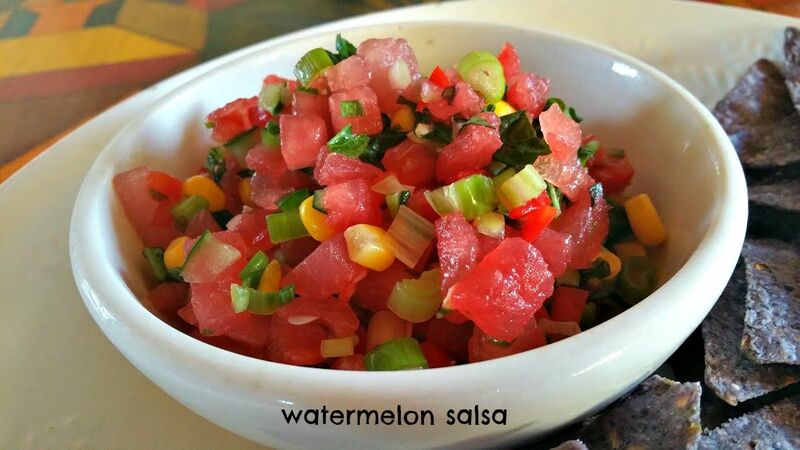 Do you have a favorite watermelon recipe? Share in the comments section and/or link to your blog if you have one. And be sure to check out the delicious sounding recipes from my blogger friends and Food Network. 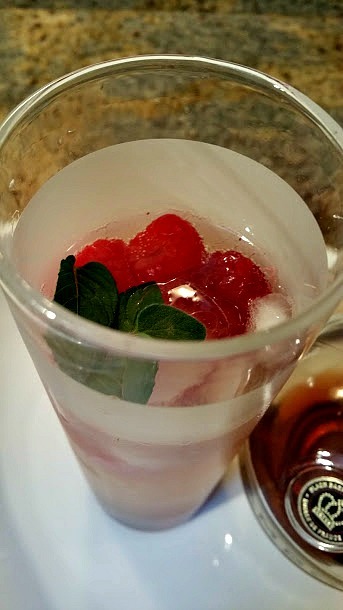 We had dinner guests last Friday, and I wanted to serve a light, cooling, refreshing, not too sweet cocktail to kick off the night. I had a bottle of Prosecco on hand and a bowl of raspberries in the refrigerator and thought..." this could be a pretty great combo". 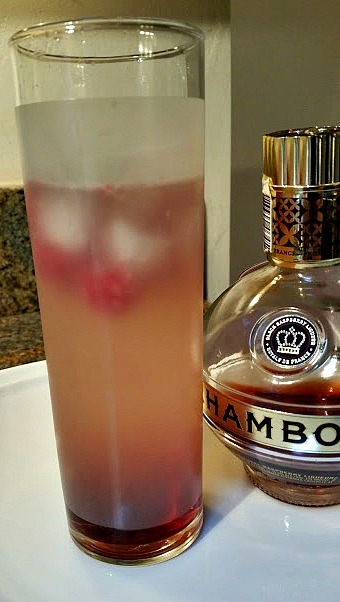 So, I combined ice-cold Prosecco in a large pitcher with Chambord (red & black raspberry liqueur) and added a large handful of fresh raspberries. I poured the mixture into large, chilled, ice-filled glasses garnished with fresh mint. The result? Delicious. 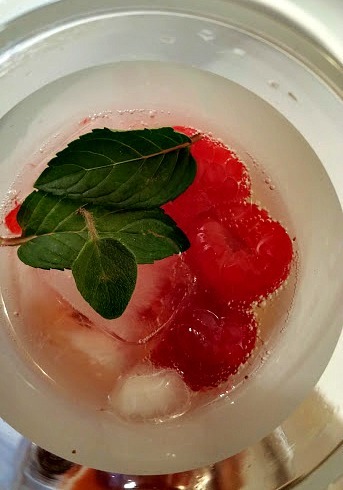 I love how easy it is to prepare this cocktail. It pairs well with appetizers, and because it is not too strong, the drink is perfect for brunch, lunch or pre-dinner appetizers.It doesn't hurt that it is absolutely gorgeous too. 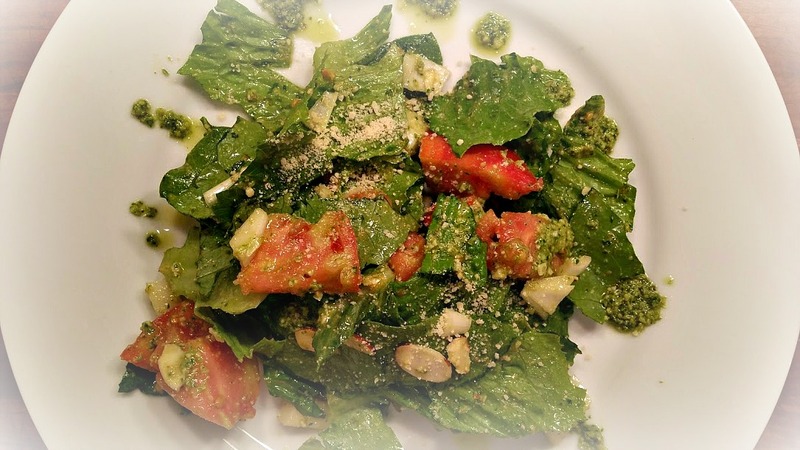 Give it a try; I have a feeling you will be making this all summer. Enjoy! Pour chilled Prosecco and Chambord into a large pitcher. Stir to combine. Add raspberries. Add three ice cubes to each glass. Pour cocktail over ice. Garnish with mint and serve immediately. Summer means easy, breezy dishes made from fresh, just-picked produce and this week at Food Network's Summer Soiree we are celebrating Summer Cocktails. Do you have a favorite cocktails recipe? Or, if you are not from the state, a favorite summer picnic recipe? Share in the comments section and/or link to your blog if you have one. And be sure to check out the delicious sounding recipes from my blogger friends and Food Network.